Fourteen-year-old Desiree can't believe her good fortune. Her fiance, the dashing and ambitious Napoleon Bonaparte, is poised for battlefield success, and no longer will she be just a French merchant's daughter. She could not have known the twisting path her role in history would take, nearly breaking her vibrant heart but sweeping her to a life rich in passion and desire. A love story, but so much more, Desiree explores the landscape of a young heart torn in two, giving listeners a compelling true story of an ordinary girl whose unlikely brush with history leads to a throne no one would have expected. An epic best seller that has earned both critical acclaim and mass adoration, Desiree is at once a novel of the rise and fall of empires, the blush and fade of love, and the heart and soul of a woman. I've liked this book since I first read it in my teens. Sadly, the narrator does not seem to have the faintest notion of French, and her mis-pronunciations are grating on the ear. The Duc d'Enghien comes out as the Duc d'Enghine, and "le jour de gloire" becomes the "jour de glory". These are just two instances. I did listen to the whole book, but would welcome the chance of hearing it properly read. Favourite Story, but listen to the sample first! Let me start by saying that the story itself gets 5 stars from me - this has been one of my favourite books since I first read it aged about 15, (more years ago than I care to remember) and I think I learned more about this period in history from this book than from any other source. I was delighted to see it on Audible so bought it with my next credit. Whilst I still very much enjoy the story, I find the narrator's voices/accents irritating, so much so that they detract from my enjoyment. I'm sure this is a personal thing, there will be many of you who don't find it so, but do listen to the sample first to see if you have the same problem. It is for this reason that I've only given it 3 stars - I'd give it two, but I'd hate anyone to think it's not a good story when it is!! Would you consider the audio edition of Desiree: The Bestselling Story of Napoleon's First Love to be better than the print version? I prefer the book version of the story, only because the narration of this book tended to spoil the story. I appreciate at the beginning that Desiree was young, but the narrator became increasingly childlike throughout the book. Did Nicole Quinn do a good job differentiating each of the characters? How? A different narrator would have made a better job, when she stopped the whiny accent of desiree and spoke more normally it became easier on the listener. I have loved this book since I first read it and knowing it was based on real events (although the author has taken some liberties) just made it more interesting. Stunning telling of a riveting story. If you could sum up Désirée: The Bestselling Story of Napoleon's First Love in three words, what would they be? Through Desiree's eyes we get a glimpse into a fascinating era in history, meet thoroughly engaging characters (who actually lived) while being swept up by a story that is tumultuous, delightful and ultimately satisfying. The performance only enhances the brilliance of the text. It is full, rich and subtle. This should not be missed. Love this book. Being a Napoleonic fan I will read anything that has a connection but this book is excellent as it shows another side. Mostly the court life of Napoleon rather than the politics, battles or the man himself. Written as a diary style the story is fiction but based largely on fact. Désirée did exist, was Napoleon's first love and was a big part of his life if not directly. Her husband General/Marshal/Crown Prince Jean Baptiste Jules Bernadotte - King Charles XIV John; comes off looking rather good. Most of Napoleon's family not so. Even her sister Julie who married Joseph Bonaparte (Napoleon's oldest brother) is not all that well portrayed. Saying this, Desiree isn't portrayed being all knowing and the only 'smart cookie' in the house, she saids herself she is stupid at times. Nicole Quinn narrates this book and she does an excellent job changing from young girl to queen of Sweeden with the right amount of age and style as to not lose Désirée personality. Well worth the money, well worth the time spent listing to. Annemarie Selinko has created a wonderful peace of historical fiction that borders on creative non-fiction very nicely. 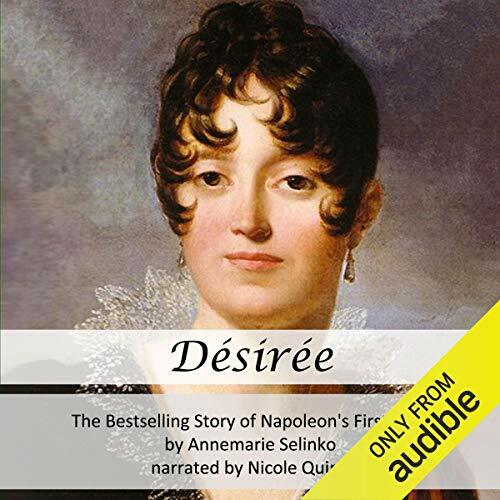 Would you consider the audio edition of Désirée: The Bestselling Story of Napoleon's First Love to be better than the print version? I have not read the print version of this book, however I must say that this has been the most enjoyable audio book I have ever listened to. Which character – as performed by Nicole Quinn – was your favorite? Nicole Quinn does an excellent job of all of the performances, it was funny and emotional and she is so excellent at the different voices, you never had to guess who was speaking. I highly recommend this book to men and women. I've read this book many times over the past 45 years, and it is one of my favourites. When I saw that it had been recorded as an audio book, I was thrilled, and bought it immediately. However, I feel that the narration has let it down. The delivery is so stilted and pedantic, it was difficult to listen to and it took me some time to get used to it. The various European accents are excellent, but some of the characterisation seem almost ot be caricatures, very strange. It won't stop me listening to it it again, though, but it will be in spite of the narration, not because of it. I have not read the book, but I was so entertained by the reading of it by Nicole Quinn I am looking forward to re listening! I loved the depth and richness of all of the characters in this historical Novel. I was stunned by the beauty and depth of the characters. What does Nicole Quinn bring to the story that you wouldn’t experience if you just read the book?
. Nicole' Quinn's voice is a pleasure to listen to. Her characters all so delicious and delightful. Who was the most memorable character of Désirée: The Bestselling Story of Napoleon's First Love and why? You will not be disappointed with this tale nor with the narrator. I just this moment finished listening and I'm overcome with emotion. How will I find the words? It's the experience of having truly been there somehow. Was it a story I somehow knew from my past? I won't know. I only know I am truly grateful for Annemarie Selinko's writing of this book and for Nicole Quinn's artful narration. I thoroughly enjoyed listening to every single word of this book and I know I will listen to it again and again! It's a treasure! Watch the movie with Jean Simmons. It's just as good and just as loved. Would recommend to others as well. I first read Desiree about 35 years ago and loved the romance; I purchased the audio to get reacquainted with the story and I LOVED it. The narration brings Desiree to life. After researching the story (half the fun of historic fiction), I discovered that Desiree wasn't well educated or interested in politics. She wasn't stupid, but rather unsophisticated and as her adopted queen mother said "every inch a French lady and quite shallow," The character of Desiree is a simple silk merchant's daughter who gets caught up in the drama and politics of two very powerful men. While she doesn't "get" their political machinations, she never fails to see the humanity and the man behind their public public personas. Desiree-because she loves so deeply. Even after Napoleon breaks her heart, she still cares for him and is always able to see the young man she fell in love with-even as he becomes the emperor who destroys the Republic for his personal gain. She loves her husband and child and always puts their welfare first and is plagued with doubt and low self esteem no matter how high she climbs. She has a good heart and wants to take care of everybody-she even empathizes with Josephine and relates to her as another woman rather than her rival. I also loved the parts describing John Baptiste fighting against the French when he was the heir to toe throne of Sweeden-heat breaking. Have you listened to any of Nicole Quinn’s other performances before? How does this one compare? Yes, but quite impossible being a 25 hr book. I did finish it is about 5 days! What made the experience of listening to Desiree: The Bestselling Story of Napoleon's First Love the most enjoyable? The story is wonderful. I knew how it was going to end more or less, but found myself totally involved in the story and characters. Loved the history from a woman's perspective. Sure the battles are mentioned and described, but briefly and only so you can understand their impact on the characters' lives. Loved the lavish detail on hair, makeup and clothes. She is after all a silk merchant's daughter. In contrast to most portrayals of women of the 18th century, the main character is so much more sophisticated, intelligent, complicated, flawed and intuitive then normal history ever gives women credit for, yet remains feminine. This is in contrast to some strong modern female characters who seem to swear, drink, and fight like a man and only indicate femininity by admitting to a love for chocolate. What about Nicole Quinn’s performance did you like? Amazing performance! Each character had a unique voice that fit the personality of the character. Even minor characters voices suggest inner character (or lack of it). Then, even while doing these voices, Nicole Quinn would add the most subtle emphasis to a word or intonation that would hint at the inner motivations of the character. Enthralling from cover to cover. One of the best books I have ever read. I was completely captivated by the unique perspective into history.